Hackers have always been shown as the bad guys, cybercriminals who seek to steal your valuable data, destroy systems and generally create havoc with computer and online systems wherever they go. While this is true to a certain extent, it’s equally valid that not all hackers are bad guys or criminals. The flip side of this criminal element are ethical hackers, also referred to as white hat hackers – who are the good guys. Given the exponential increase in online crimes in recent years, ethical hackers are in high demand. Large companies and government organisations are known to pay big bucks to hire the best certified ethical hackers. Their primary responsibility is to identify weaknesses in their existing IT infrastructure, to protect their systems and prevent sensitive data from falling into the wrong hands. 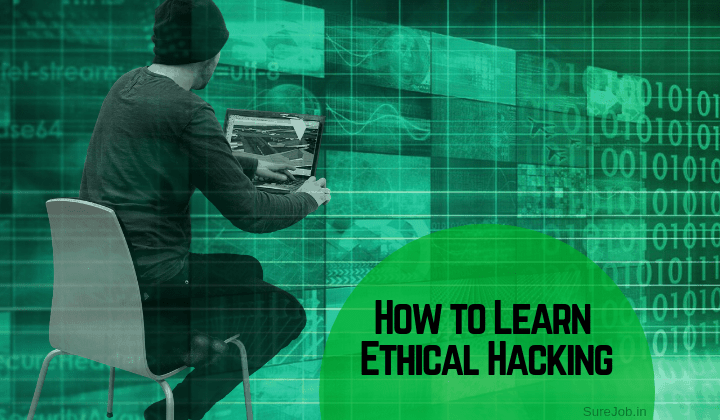 Ethical hacking today is an advantageous and lucrative career option in India, and there are several ways to learn ethical hacking if you wish to make a career in this field. In this article, we will look at what it takes to become an Ethical Hacker in India, how to build a successful career in this challenging domain and the job options which will be available to you once finish your training. Since ethical hacking has everything to do with information technology, it goes without saying that a strong background in IT is definitely a huge plus. So a degree in Computer Science or a diploma in networking systems will definitely give you a huge advantage. And if you have a few years of work experience in a tech support position or understand the fundamentals of networking like Network+ or A+ – even better for you. Once you think you have gained the work experience that you need you can move ahead to the certification process. Certification is essential for two main reasons. It will give you an edge over the competition, thereby increasing your chances of getting the job you want. Secondly, as a CEH from a leading institute with work experience to boot, you stand a much better chance of being hired with a higher pay packet. As discussed in the preceding paragraph, it’s always better to get trained and certified from a leading institute, so make sure you choose the best option to learn hacking which is made available to you. The first step involves doing a course and getting certified as a Systems Security Certified Programmer (SSCP). This is an entry-level certification needed to demonstrate that you possess the required technical skills and knowledge to monitor, administer and implement IT infrastructure using the latest security protocols, procedures and practices recommended by top cyber-security experts. This is a more advanced certification which validates that you have the necessary expertise to effectively design, execute and administer a cutting-edge cybersecurity program. Acquiring this advanced security certification can open the doors to several senior level job opportunities for you. These could range from that of a network architect going all the way up to the positions of a Chief Information Officer/Chief Information Security Officer/Director of Security with leading companies and/or government establishments. To become a hacker/CEH, you will first need to clear the CEH examination, conducted by the EC Council. Typically this examination includes 125 multiple choice questions and has a duration of 4 hours. But before this, you will first need to join the accredited course on their training portal. You can either opt for the 5-day Instructor-led live classroom training or choose the online training (by live instructor) option. It will provide you with the advanced hacking tools and techniques (in use by hackers and information security professionals globally) and other ethical hacking requirements that will help you understand security issues from a hacker’s perspective – making it easier for you to identify its vulnerabilities. Now that you know what you need to do to acquire the certifications required to become an ethical hacker let’s take a look at what lies in store for you regarding employment opportunities. According to global technology major IBM, India needs a massive 3 million cyber security professionals going forward against a supply of less than 100,000 right now. As per a recent industry survey, India’s cyber-security market is poised to grow at a CAGR of over 19% during 2018-2023. It’s a growth curve which is likely to be driven by an increasing number of government initiatives towards digitising processes across crucial sectors like healthcare, BFSI, retail, gems & jewellery and education. So the job opportunities are clearly, limitless and not sector specific since there is no business or vertical today which can function without the use of computers or adequate IT infrastructure. Hence the need and demand for trained cyber-security professionals will only grow in the coming years as companies and governments scramble to protect their Intellectual Property Rights and sensitive data from cybercriminals. Now that you have all the information pertaining to the profile and certifications needed to kick-start your career as a cyber-security professional and ethical hacker, we come to the critical question – How much money can you expect to make from it? To give you a better idea, I have listed below a few indicative salaries of a CEH in India, as per different job designations. Information Security Analyst: INR 4.5-6 Lakhs p.a. Certified Ethical Hacker (CEH): INR 3.5-5 Lakhs p.a. Security Consultant (Computing / Networking / Information Technology): INR 6-8 lakhs p.a. Information Security Manager: INR 12-15 Lakhs p.a. With the demand set to soar in the time ahead, you can also expect a proportionate increase in the money you make as a certified ethical hacker. With more and more companies going online and an increasing number of tasks getting automated with the arrival of newer technologies like AI and Machine learning, India Inc. is apparently feeling the pinch of an insufficient supply of cyber-security professionals, including certified ethical hackers. Needless to add there is an urgent and growing need for young professionals in this domain and this could well be the perfect time for you to take the plunge, so do give it some thought.